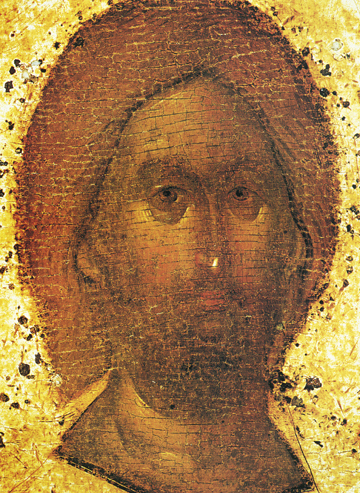 This icon was painted by the master iconographer Theophanes the Greek, a contemporary and teacher of St. Andrei Rublev, the greatest iconographer of Russia. They worked together in this Church of the Dormition and in the old Church of the Annunciation with the other famous iconographer of that period, Prochor of Gorodec. This is a detail of the Deisis, or Supplicating, icon where Christ is sitting on a throne and He is surrounded by Heavenly Hosts and Angels who are enclosed in the blue ?madorla’, which symbolizes the entire Cosmos and God’s protection and Providence which extends over all of Creation. In this detail we only see His face with luminous golden, orange, and reddish browns and surrounded with golden light. His eyes are merciful yet searching, opening to us a dialogue with Him and our deepest heart, for all of our hidden secrets of the heart, both good and evil, both known and unknown to us are known and revealed to Him. The Lord came to save sinners, so it is not our sins that prevent Him from saving us, but our dishonesty and lack of repentance. If we give him our sins and our heart, He will remake us in His Image and Likeness, and refashion us to become as far as humanly possible, like Him.